There are some things you give up when staying in really cheap hotels. Comfort, convenience and service are the first to go, of course, but that’s to be expected. Unfortunately, safety is usually next on the list. Now, if you’ve been here before you may know that I tend to give anything remotely dangerous the “of Death” suffix, but this thing really was frightening. Traveling with my buddy Rich, we’d decided to stay at a nicer hotel that had a small kitchen in the room. I plugged my Macbook into the nearest outlet and got one hell of a shock when I touched the laptop’s aluminum case. I may have shrieked like a six-year old girl at summer camp — Rich laughed so hard he nearly spilled his beer. After very carefully testing the setup on a different outlet, I confirmed that it was just a wiring problem with this one outlet and not my laptop. Heating up leftovers later in the Half Pint microwave was a challenge, but we got it done without further hot electrotherapy action. One cool side-effect: the plate in my head is now magnetized, so I’ve got some new bar tricks. Finding a power outlet in a budget room can be tricky. I’ve been in hotels where it was hidden under the bed or I had to choose between using the fan or charging my laptop, but I’ve never had one that was nine feet off the ground. At six foot, I’m still about a foot short — I contemplated trying some kind of jumping kung fu move but decided that really would get me electrocuted or knocked out. The only other outlet was in the bathroom, next to the toilet. It really was the worst office ever. I guess they were trying to save money by discouraging guests from using extra electricity when they placed the outlets so high. I have experienced ALL of these things in Argentina, unfortunately. I had one outlet of death in my last apartment that I was scared to even walk too close to. I have a much nicer apartment now but I have some of those crazy placed outlets. I have one inside of a broom closet and one inside of a kitchen cabinet about 6 feet off the ground. Great for making toast NEXT to the plates I guess. My first widow heater was in Havana, however. Although it took me more than a week to figure out that there was any hot water to have at all. Until one day I stepped into the shower, turned on the water and got ‘burned’. What? How? Due to the hot weather, the water never really got cold so I hadn’t even thought about looking for hot water. But what a luxury to have these killer shower heaters in cold areas! What happens in Honduras stays in Honduras, Dean. Here in Northern England we neatly circumvent these dangerous issues by way of never having discovered electricity. That said, banging rocks together for heat can leading to some pretty effing nasty accidents. Even though you suffered greatly in the making of this post, I enjoyed it a lot. Hope you don’t mind. 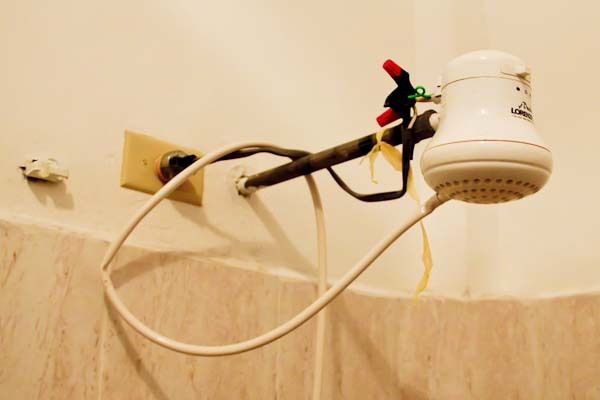 The shower with the wire on top looks extremely scary, but did you use it? It is so incredible that it makes me smile…. You are much braver than me, I don’t think I could have brought myself to use that shower, at least with out wrapping plastic and then duct tape around that wire. 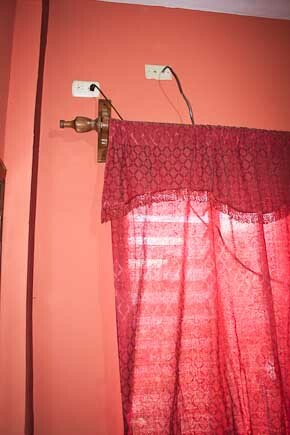 They place the socket so high in your room so you will have to rent one of the hotel monkeys…. I want a hotel monkey! I have been shocked by outlets so many times during my travels in Latin America. And those showers scare the Hell out of me! “the plate in my head” ?? Was this caused by some other “of death” contraption? Maybe rubber soled boots and washing-up gloves are the answer! You’ve clearly put your life on the line for this post, but it is hilarious. 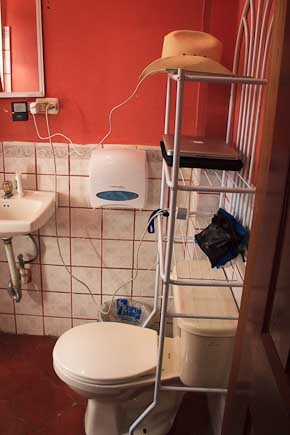 The outlet above the shower, gotta wonder what was going through the electrician’s head – not much I imagine! Oh god! That’s scary stuff!! Nicaragua just keeps coming up over and over. I’m getting scared. ahh!! i lived in costa rica for six months when i was 16 in a house with one of those water heaters and i never realized how dangerous it was!! That’s really scary and funny at the same time. I despise the term “lol” and am firmly resolved never to use it but you nearly got one out of me with that post. The thing about getting shocked is that although you would never describe it as a pleasant experience you do kind of feel more alive afterward. Maybe it’s the endorphins. you get what you paid for….if staying in San Pedro try the InterContinental, if in La Ceiba the Quinta Real. Both nicer then most NYC hotels.